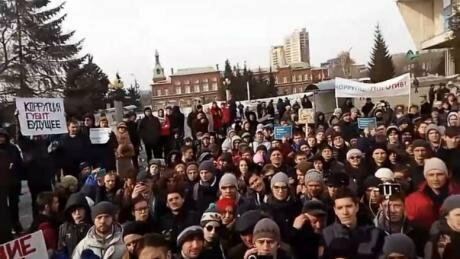 26 March 2017: 2,000 protesters come out for anti-corruption protests in central Omsk, Siberia. Image still via YouTube. Some rights reserved.A busy intersection in downtown Washington DC right in front of the Embassy of the Russian Federation now bears a new name, Boris Nemtsov Plaza, in honour of the opposition politician and outspoken critic of the Kremlin who was murdered in February 2015. Since Nemtsov’s death, supporters of the Russian opposition have held annual marches in Moscow to commemorate the bravery and determination of a leader who fought for integrity, transparency and accountability in government. Nemtsov’s murder, believed by many to be politically motivated, has mobilised thousands who are fed up with an entrenched, elitist system that enriches a few through corrupt and illicit activities and shady offshore business deals. While the politically disillusioned among Russian society protest on major city streets, those concerned with bread-and-butter issues attempt to affect change at the local level. This is evidenced through residents’ efforts to have a voice in city, town and neighbourhood urban planning and development decisions, which in many cases are overshadowed by corruption and conflicts of interest. Russians strive to petition their local officials for better quality public service delivery, whether it be for roads, schools and health care facilities, as in rural areas such infrastructure and facilities can end up dilapidated and outdated. Though there are optimistic signs of an economic upswing, the benefits are unlikely to trickle down to most people, especially in rural areas. Russians are worried about what the future holds for them with fluctuating oil prices and foreign sanctions. For now, it appears the future holds more of the same old story. As Russia prepares to elect a new president on 18 March, there are no viable opposition candidates. The ballot will list several names, but the man who has already governed directly as president or indirectly as prime minister for the past 18 years will most likely be named president, maintaining his position of power through 2024 and making him Russia’s longest-serving leader since Brezhnev. Photo: Alexei Druzhinin/Zuma Press/PA Images. All rights reserved.Vladimir Putin’s rise to power in 1999 came at a period when people craved stability, order and security. The country had endured economic instability; dealt with political scandals; witnessed the horrors of the first Chechen War; and lived through several terrorist attacks. Fatigue and fear plagued the general public, generating a desire for a more heavy-handed approach to ruling the country that would bring stability, order and security. The state, in turn, responded to the public’s demand for better order by tightening its fist around independent media, then crushing the political opposition under its heel by controlling elections. An illusion of order may have appeared but it came with a hefty price: repressive laws, authoritarian policies, rights violations and limited civic space. The CIVICUS Monitor, which tracks and rates civil society conditions across all UN member states in close to real-time, has found that civic space in Russia has closed dramatically as civil society groups have been publicly vilified and marginalised. Groups receiving foreign funds or engaging in political activities have been discredited as so-called “foreign agents”. Any form of civic activism on sensitive or controversial issues is quickly crushed. Investigative and independent journalists are under threat and in constant danger. Journalists, business opponents and members and leaders of the opposition face persecution, vilification, imprisonment and, as in Nemtsov’s case, physical violence. In the face of constant fear and repression, Russians have nonetheless responded, with groups galvanising around environmental, economic, labour and social issues. Tens of thousands of truck drivers mobilised in 2017 in a nationwide strive over an increased road tax that would allegedly line the pockets of officials and oligarchs rather than create better road conditions. Mass protests have taken place across Russia’s eleven time zones around causes and key moments, such as Nemtsov’s murder. Corruption – a sticking point for so many – has led to mass protests under anti-corruption advocate and former presidential hopeful Alexei Navalny’s campaign. Though the state has made deliberate strides to suppress civic activism, thousands remain undeterred and still persevere. The status quo in the Kremlin is likely to continue come 18 March, but there may also be an impending “wind of change” as thousands protest, from Moscow to Vladivostok, in support of Navalny, who was prohibited from running in this year’s elections and now faces charges of organising unauthorised assemblies, as well as in support of other causes – from socioeconomic to environmental issues. When citizens exercise their fundamental freedoms to organise, speak out and protest, the state has a duty to protect them. The Russian authorities, however, have repeatedly failed in this regard, despite their obligations under national law and commitments to international human rights standards. Rather than protecting citizens, the current system criminalises dissent and suppresses civic space. 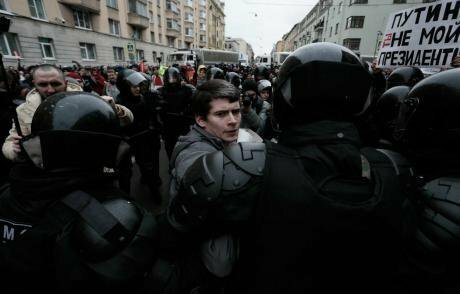 Watchdog groups have documented incidents in which the state security services (FSB) has detained and tortured activists who represent anti-fascist or anarchist groups. In the volatile North Caucasus, Memorial Human Rights Centre has been persecuted for its efforts to document and report on egregious abuses in the region. In an attempt to suppress Memorial’s increasingly powerful voice, the authorities arrested the head of the organisation’s office in Grozny, Chechnya, Oyub Titiev, who now faces dubious criminal charges, and Memorial’s office in Ingushetia was burned and the Dagestan office’s car also destroyed. 28 January: an election boycott rally, St Petersburg. (c) NurPhoto/SIPA USA/PA Image. All rights reserved.Law enforcement has repeatedly failed to protect protesters and have instead prevented protest actions by tightening bureaucratic restrictions. Police have used intimidation tactics and warnings to keep people off the streets. Organisers of the truck drivers’ strike last year were reportedly harassed, interrogated and detained by police. Anti-corruption protesters, environmental activists and human rights defenders are not fully protected under the law, especially when the judiciary is at the behest of the authorities. In many cases, attacks against those expressing independent opinions and critical voices are not properly investigated, and perpetrators are rarely brought to justice. With the upcoming election largely a foregone conclusion, Russians will most likely see another six years of Putin’s policies. As the past has shown, prolonging Putin’s power means hardship and difficult times ahead – for civil society and for the society as a whole. Russian citizens have exhibited resilience against seemingly insurmountable odds. Their task, however, is less daunting when the international human rights community actively shows solidarity with activists, peaceful protesters and independent associations in Russia by keeping the human rights situation at the forefront of any dialogue and interactions with the government. It is crucial for the wider human rights community to be united in condemning the abuses and demanding an end to violations, even in the face of backlash from the Russian authorities. 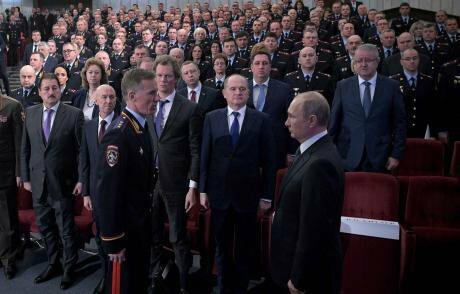 A resolute and unequivocal stance on fundamental freedoms demonstrates to Putin that crackdowns on civic space and the use of political violence will never be ignored and his harmful tactics will always be met with fierce resistance.